The mouse is back in the house. Yep, you read right, the mouse is back. The talented Laura Numeroff has spun out another fabulous book with that famous “nameless” mouse. This book is just in time for the holidays. In fact if you celebrate Christmas this book is a must have for your child’s library. This energetic little mouse is back, but this time with a host of holiday antics. Just like the predecessor, If You Give A Mouse A Cookie one thing leads to another till you finally can’t resist being in the holiday spirit. After you finish this story you will be ready to decorate your own tree. 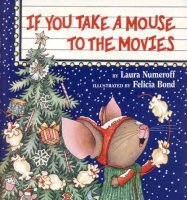 The mouse and his friend go to the movies, eat popcorn, make ornaments, singing Christmas carols, decorate a tree, play in the snow and keep you entertained for 32 pages. Felicia Bond does an excellent job illustrating this book. Her colorful, busy and expressive illustrations compliment the story perfectly. Right down to the mouse’s candy cane underwear. I recommend this book for children ages 2 – 5. A note from the inside cover of the book: A portion of the royalties from If You Take A Mouse To The Movies will be donated to First Book, a national nonprofit organization that promotes children’s literacy.